Lira Motorsports announces today that Korbin Forrister will be behind the wheel of the No. 59 ARCA Racing Series entry at Talladega Superspeedway for this weekend’s General Tire 200. Ever since he was able to walk, Korbin had the need for speed. 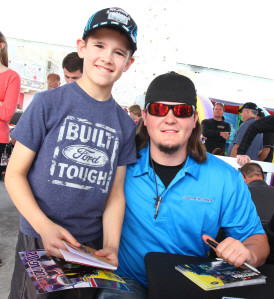 He knew at a young age that motorsports was where he wanted to be. He can typically be found at the dirt track because that’s where he got his racing start, but his passion truly lies within asphalt stock car racing. Forrister, who has years worth of experience in both the ARCA Racing Series and the NASCAR Camping World Truck Series, is excited to be tackling the high banks of Talladega. This will be his second career ARCA start at the track following his 13th place finish there in 2013. This weekend, Forrister will be bringing new sponsors on board of the No. 59 Ford Fusion. Far From Stock will be the primary sponsor on the hood of the Lira machine, as well as Banana Oral Solution, and Tilted Kilt. Lira Motorsports would like to thank the sponsors and Korbin for coming on board this weekend in Talladega for the General Tire 200. It will be shown live on Fox Sports 1 at 6PM/ET. About Lira Motorsport: Lira Motorsports is a multi-car, multi series race team owned by Carlos and Amanda Lira. 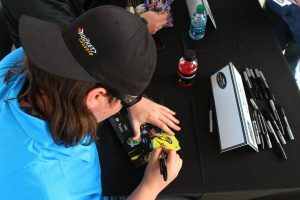 The team competes in the ARCA Racing Series, NASCAR Camping World Truck Series, NASCAR Whelen All- American Late Model, and IMSA Sportscar events nationwide. Lira Motorsports’ ARCA and NASCAR Truck programs are operated from an 18,000 square foot shop in Mooresville, North Carolina and the late model team operates from a 12,000 square foot facility in Port Orange, Florida, just minutes from Daytona International Speedway. Stay Social with Korbin: Make sure you follow Korbin on social media throughout the weekend; Facebook.com/KorbinForrister, Twitter – @KorbinForrister. For more information about Korbin, visit http://www.korbinforrister.com/ or to schedule an interview, contact Matt Casto of The Sports Agency at (214)-458-2301 or E-mail Matt at matt@thesportsagency.com.